When it comes to websites on the internet, security is of utmost importance and with Google announcing HTTPS as a ranking signal moving your website from HTTP to HTTPS has become crucial. This post covers the basic difference between HTTP and HTTPS, the reasons to migrate and the steps to follow. HTTP stands for HyperText Transfer Protocol, it is used for communication purpose on the world wide web (www). HTTPS on the other hand, is the secure version of HTTP, HyperText Transfer Protocol Secure. The data sent over the communication channel that is established therefore is secure. HTTPS, therefore, is usually used on websites to that deals with banking or e-commerce transactions. Apart from the three key layers of protection provided by HTTPS there are several other reasons for you to migrate your website from HTTP to HTTPS. Let’s have a look at the three key ones. Not only does making your website secure help protect your website, it even helps in your ranking with Google’s secure web initiative. SecurityThe security is provided by TLS (Transport Layer Security) and is essentially provided in three layers viz. Encryption: Data is encrypted and no one apart from the end user can decrypt it. Thus , if there are is any eavesdropper present trying to listen or steal the information it is prevented. Data Integrity: Data passed over the channel can’t be corrupted or modified without detection. Better PerformanceWith the upgradation of HTTP to HTTP/2 (HTTP 2.0) most of the browsers support the new protocol over the secure HTTPS network. Moving to HTTPS increases the speed of your website and in turn boosts the performance of your website and user experience. 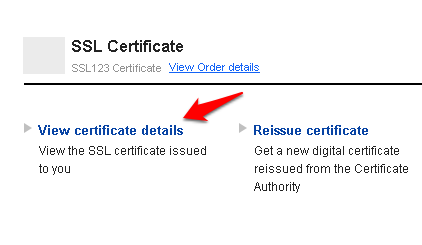 A pop-up will now show the certificate.For installing your SSL certificate on your server, it depends mostly on the software that you are running. The steps change accordingly. Refer the to see the appropriate instructions. OthersII: If you want to host multiple SSL certificates for different domain on the same IP address, then you need to install them via SNI (Server Name Indication). Installing SSL via SNI doesn’t require a dedicated IP address. Resellerclub supports SNI on their HostGator servers. To install it you need to contact the Support Team and they install it for you. Adding 301 redirect is an important step to all your new URLs. You can either use a plugin or add the following code to your htaccess file via FTP (Note this is for WordPress sites). First you update Sitemaps to use the HTTPS version of the URLS then, update robots.txt file to include the new Sitemap. It is important to update robots.txt and Sitemap for SEO purposes, as it consists website URLs. As all the website URLs are changed after migrating to HTTPS, Google needs to recrawl this. Sometimes it may take weeks for Google to make these changes correctly, so it is recommended doing this as soon as you can to speed up the process. Lastly, you need to update your Google Analytics Website’s URL. To do this, click Admin under your account and then view settings. Then change the URL to the HTTPS version. Change your Property Settings as well, so as to not lose history. As you have noticed, there are a lot of steps when migrating from HTTP to HTTPS make sure you do follow the steps properly and you should be successful. If you have any comments or suggestions, feel free to drop us a comment below.